The NAFA racing year begins on October 1st and extends through September 30th of the following calendar year. There are four classes of competition: Regular, Multi-breed, Veterans and Open. 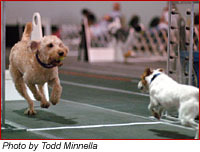 In Multi-breed, teams must consist of different breeds (minimum of 4, maximum of 6, with 4 different breeds running in a heat). In the Veterans class, every dog on the team must be at least 7 years old, the jumps are also lowered and racing is limited. 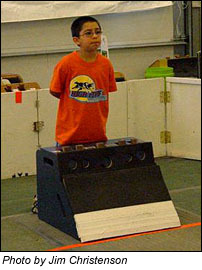 In the Open class, dogs can be combined from any club, but teams are not eligible for record times or regional championships. In 2016, there were over 333 NAFA-sanctioned tournaments hosted in 38 states and provinces, hosted by 130 US and Canadian clubs. 8,359 teams raced in the 340 different clubs, with 3,854 total club entries. Tournaments are open to all dogs, including mixed breeds and ALL purebreds (including the bully breeds). NAFA will not sanction a tournament at a site that excludes dogs on the basis of breed unless the exclusion is mandated by governmental law or ordinance and the host club has attempted and been unable to qualify for an exemption to governmental exclusions.